If this is the first time you have visited our website I’m delighted that you are interested in Copthorne, one of the premier independent prep schools in the South of England. If you are already associated with Copthorne I hope you will find all the information you need here. As Headmaster it is my responsibility, and my privilege, to shape the direction of our school, support and encourage our fantastic team of staff, and ensure that every Copthorne pupil and parent gets the very best experiences and memories from the educational opportunities we offer. I am in the fortunate position to see first hand the benefits Copthorne offers young people, whether they are day pupils, or taking advantage of full or flexi boarding. It is a place in which energy and enthusiasm is everywhere – academically, creatively and on the sports fields. All this activity creates a very strong sense of togetherness and youthful camaraderie among the pupils, and a deep-seated respect for themselves and everything around them. I know choosing a school is a big decision and I hope that this website provides answers to the many questions you will have. 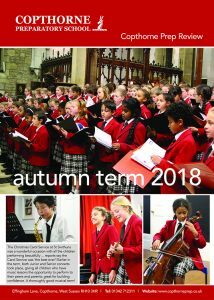 There is much more we can show and tell you and I would urge you to visit the school at your earliest opportunity to experience first hand the special atmosphere and opportunities that exist here. To arrange a visit please get in touch with the Registrar, Mrs Kathryn Billingham-West. You can either telephone 01342 712311 or send an email to admissions@copthorneprep.co.uk.